Tech Revolt: Why Are Silicon Valley Employees Fighting Government Contracts? We live in an increasingly technological world—Fitbits monitor our health, Alexa organizes our homes, and social media guide our social lives. Global efforts to develop and implement artificial intelligence (AI) are escalating into what some call an arms race, and cybersecurity is becoming a central security concern as hacking of governments and tech companies occurs with increasing frequency. The US needs to stay ahead of tech trends and use cutting-edge technology to boost security as well as its international reputation as an innovator. To this end, government agencies are signing off on more and more contracts with tech corporations. Rekognition, Amazon’s facial-recognition software, is currently in use by law enforcement agencies in Oregon and in Orlando, Fla. Google was briefly involved in the US Department of Defense’s AI program, Project Maven. And Amazon is currently competing with Microsoft, IBM, and Oracle for a government contract for cloud computing. The US government needs to work with tech companies and tech executives clearly want to work with the US government. 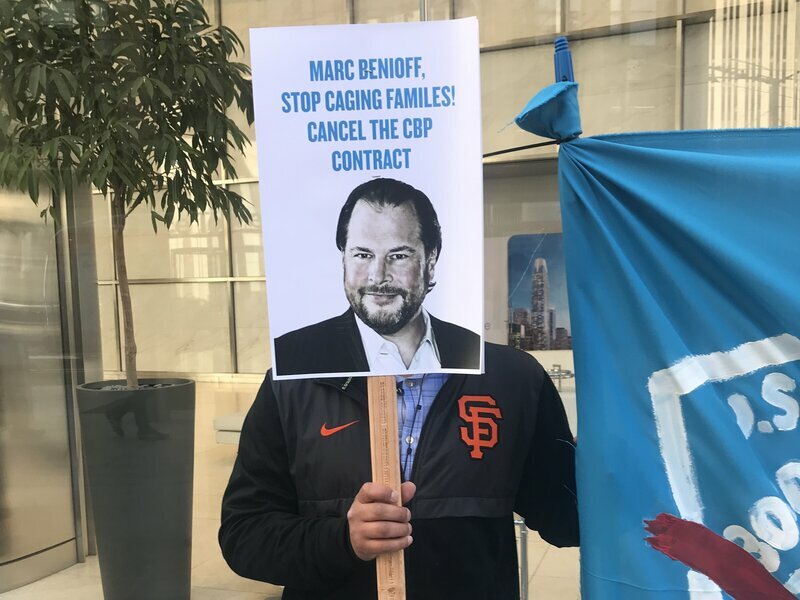 But in recent months, a number of major tech companies—including Amazon, Google, and Salesforce—have experienced employee backlash against government contracting. Employees have signed petitions, spoken out, and even resigned in protest of such contracts. Regardless of right and wrong, Silicon Valley’s employees are proving to be a formidable barrier to tech-government contracting. So why are these employee protests happening, and why are they such a big deal? The answer lies in two key elements: Silicon Valley’s increased distrust of government and Big Tech’s reliance on individual employees. Silicon Valley has earned a reputation for its liberal politics and a recent Stanford study found that reputation to be well-deserved. During the 2016 presidential race, 95 percent of political donations from tech employees went to Hillary Clinton. As political polarization increases, individuals on both sides of the political aisle are becoming less trusting of government, and Democrats’ trust in government is at its lowest level in sixty years. This loss of faith is accompanied by an increase in vigilance—Silicon Valley’s largely liberal employees are starting to scrutinize tech giants’ work with the US government. Big Tech can’t afford to ignore this scrutiny. Tech companies are fueled by employees’ unique talents and creative minds, and according to Anne Manning, “individuality is a necessary ingredient for creative thinking.” Accordingly, company cultures revolve around individual well-being and fostering individuality. Amazon, Alphabet, Facebook, and Salesforce were named as LinkedIn’s top four workplaces in 2018, and tech companies are known for offering employees perks like nap pods, fitness classes, and in-office cafes. A futuristic “nap pod” for employee use in one of Google’s offices. The recent employee protests stem from the very individuality on which these companies rely. Tech companies are vulnerable to their own employees; individual creativity fuels their businesses, so employees hold leverage. This balance of power gives lower-level workers power over upper-level decisions. Employees know this and are using their influence frequently and effectively. Earlier this year, extensive backlash—including a petition signed by four thousand personnel and the public resignation of a dozen protesting employees—prompted Google to decline to renew its contract for the Department of Defense’s AI program, Project Maven. In a forceful expression of employee power, Google workers successfully leveraged their value to the company and ended a government contract in which they theoretically had no say. The subject of tech employee protests came up at the Foresight, Strategy, and Risk Initiative’s report launch last month. Panelists Sharon Weinberger and Rob Atkinson posed a question: is it appropriate for employees to challenge defense and security contracting in this way? Or is it their right? Tech employees have demonstrated that they have the power to check their employers and, by extension, the US government. Despite the best efforts of Silicon Valley and defense executives, tech-government contracting faces a bumpy road ahead. Giulia Neaher is an intern with the Foresight, Strategy, and Risks Initiative in the Atlantic Council’s Scowcroft Center for Strategy and Security. She is currently an undergraduate student at Washington University in St. Louis and is studying international affairs and economics.